Yawn, shiver. It’s 6:45 a.m. and 55 degrees in the Vallejo carpool line. Happily I’m quickly in a Toyota 2-door pickup truck. No heat, but it’s bearable. The driver is a large, almost sumo-looking fellow and he’s probably not feeling much chill. I plop $1.25 into the little tray between the seats – “thanks” – and we exchange comments on the state of this miserable ‘summer’ weather. KOIT radio, light rock, less talk, and light traffic too, today. I often think about an earlier version of car-sharing that San Francisco commuters enjoyed in years past. The Mission Street Jitney. If you were around in San Francisco in the 60s and 70s (or earlier), you probably know about the Jitneys, the cars that ran up and down Mission Street, picking up passengers on nearly every corner. A ride at that time cost a dime, although the term “jitney” was slang for a nickel, which was originally the standard fee. The first time I saw a jitney I was relatively new to the City, having just moved here in 1967 from St. Louis. What I saw was an oversized black car pull up to a curb on Mission Street. A couple of people jumped out and another person jumped in. There was a clandestine, almost sinister feel to the activity, and I remember wondering if I was witnessing a CIA or FBI operation of some sort, or perhaps some criminal activity. I became even more alarmed when, a few blocks later, I saw the same thing happening again. At the time I didn’t see any signs on the cars or on the curb indicating that this was a licensed form of public transport. Later, when the jitneys were gone and I learned what jitneys were, I was sorry I’d never had the opportunity to ride in one. Over-regulation and the advent of BART finally did them in. They first appeared in San Francisco in 1914 as transportation for the workers and attendees to the World’s Fair (the Panama-Pacific International Exposition). 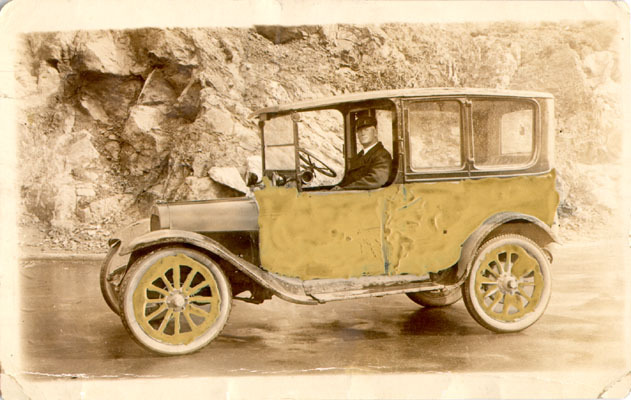 By 1915 there were over 1400 private Jitney operators and that number doubled within a few years as they provided transportation for suburbanites coming into San Francisco. Many people moved to Oakland after the 1916 earthquake, along with some Jitneys, and the Jitneys would transport them from various spots in Oakland to the ferries that crossed the bay. As the years passed, Jitneys upgraded their cars and some even became mini-vans, but the spirit of the Jitney remained. A fast, personalized service with a variety of driver and car styles and a natural flexibility. Sounds a lot like the casual carpool, don’t you think?